In an industry that has been famously guarded about its workplace diversity, Google on Wednesday disclosed its record when it comes to hiring women, African-Americans and Hispanics. The data reveals statistics that the company itself admits are too low and strikingly below other industry averages. Women comprise just 17 percent of its global tech workforce, according to data Google published on its website and released exclusively to the PBS NewsHour. When it comes to leadership, women only account for 21 percent of the top positions in the company, which has a workforce of just under 50,000 people. 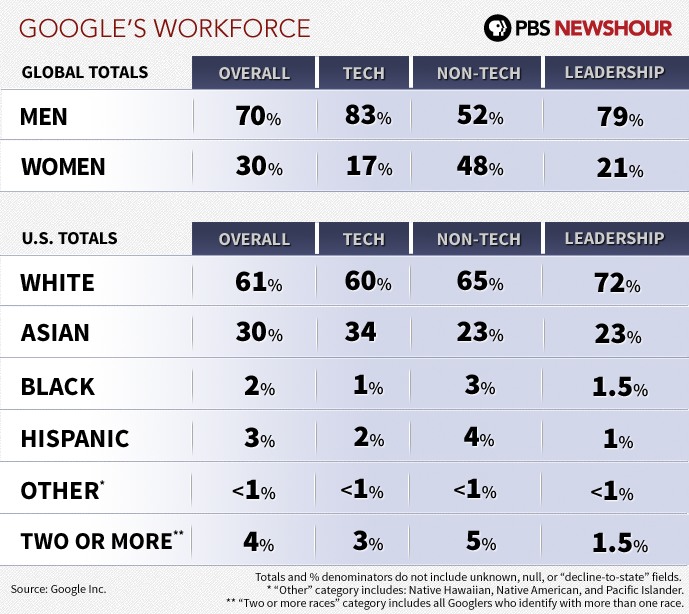 Google, which has been under rising pressure along with other tech companies to release diversity data, also reported that blacks comprise just one percent of all tech employees in the U.S. Hispanics account for two percent of the tech workforce in the U.S. Asians account for 34 percent of the company’s U.S. tech workforce. When it came to its overall workforce around the world, 30 percent of Google’s employees are women. But in the U.S., racial and ethnic data show that 61 percent of the workforce is white, 30 percent are Asian, three percent are Hispanic and two percent are black. Four percent are two or more races. The data shows that Google trails others when it comes to the tech workforce in particular. Hiring numbers are generally considered a closely guarded secret among Silicon Valley companies and reliable numbers are hard to come by, but prior reports have shown that fewer than six percent of tech engineers are either black or Hispanic. Other reports have found the industry’s norm of women employed in the technical workforce are roughly 20 percent or a bit higher. When it comes to engineers, one survey of 133 startups done by an engineer at Pinterest found 12 percent of engineers were women. Google and other major tech companies have been the target of increasing pressure to hire more women and minorities — and to become far more transparent about whom they have hired until now. Companies with more than 100 employees are required to file that information with the U.S. Equal Employment Opportunity Commission but the EEOC says it is legally prohibited from making that data public. The employers are not under any obligation to make that data public in most cases. Past efforts to obtain that data — including a major effort by CNN back in 2011 — have only yielded partial information about a handful of companies. When CNN tried to persuade leading tech companies to disclose its hiring numbers, 17 of them refused. Until Google’s disclosure Wednesday, only a few major technology companies, including Intel, have publicly posted that information. Google’s own record on this issue has been the focus of articles in the New York Times and the San Jose Mercury News, among others. But public campaigns have stepped up the pressure — just this spring, Jesse Jackson visited Google’s shareholder meetings in Silicon Valley. Google officials told the NewsHour that the company had been “working toward disclosing this for the better part of the year” and said Google invited Jackson to its meeting last month where the company promised for the first time to release the numbers. The tech giant was praised for its new commitment to transparency but its record on diversity was criticized. 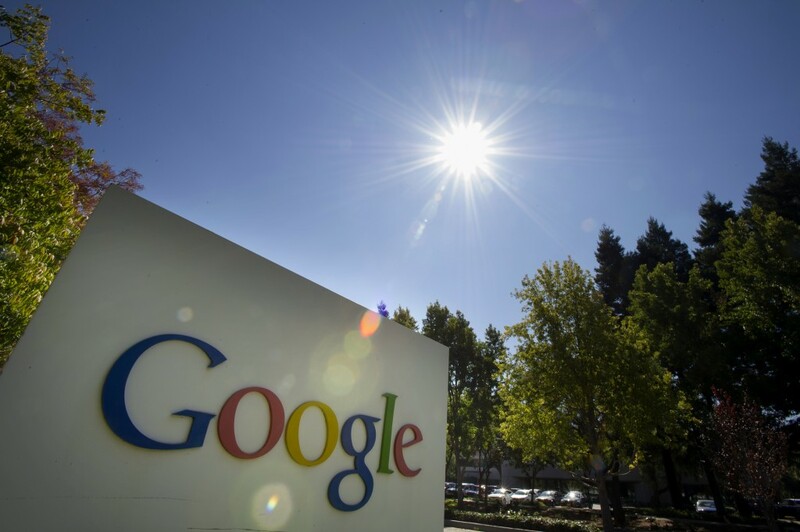 Vivek Wadwha, an entrepreneur and vocal critic of the Silicon Valley’s hiring practices, said he was disappointed by Google’s record and contends the company had “no excuses” for it. “About a quarter of today’s pool of highly experienced software developers is female, and a company such as Google — which has its pick of the crop of new graduates as well as experienced engineers — should have far greater diversity,” Wadhwa wrote in a post for the NewsHour. Telle Whitney, the president and CEO of the Anita Borg Institute, a not-for-profit that works to foster a more welcoming culture for women in tech, said Google’s disclosure is a significant step. But she told the NewsHour in a statement, the numbers themselves are below what they should be. Wednesday’s announcement comes amid other developments of late that are casting a harsher spotlight on how the tech sector deals with women and minorities. Companies are increasingly criticized for a culture that too frequently fails to recruit, promote and retain women, especially at the leadership levels. In some cases, companies have are being accused of fostering a kind of “bro culture” that is unwelcoming to women. And there are several high profile stories of late that paint a picture of workplaces where outright sexism and misogyny persist. Engineer Julie Horvath accused Github of gender discrimination and intimidation after announcing her resignation last month, triggering an internal investigation. Just last week, several female tech leaders posted an open letter blasting parts of the culture, citing the Github case and other offenses in the industry. Google itself has not been publicly accused of any of those kinds of allegations. But it has been called to disclose more information about its hiring record and particularly what has happened to the role of women. Company officials say today’s announcement is the first of a number of moves to attract and retain more female talent in tech and engineering. Wadhwa says he believes Google’s decision to disclose is another important chapter in a story that may be starting to move in a different direction. PBS NewsHour’s coverage online includes guest columns by both Vivek Wadhwa and Telle Whitney — along with an article about the state of STEM education, how the gender gap has grown and what approaches are being tested to reduce it.